Lewis Hamilton earned the 74th pole of his Formula 1 career after setting a new qualifying lap record in Spain on Saturday. "I needed a pole," he said. "I have not had a pole in a while." His last pole was at the 2018 season opener in Australia. The line-up for the weekend was: Mercedes - Hamilton and Valtteri Bottas; Ferrari - Sebastian Vettel and Kimi Raikkonen; Red Bull TAG Heuer - Daniel Ricciardo and Max Verstappen; Force India Mercedes - Sergio Perez and Esteban Ocon; Williams Mercedes -Lance Stroll and Sergey Sirotkin; Renault - Nico Hulkenberg and Carlos Sainz; Toro Rosso Honda - Brendon Hartley and Pierre Gasly; Haas Ferrari - Romain Grosjean and Kevin Magnussen; McLaren Renault - Fernando Alonso and Stoffel Vandoorne; Sauber Ferrari - Marcus Ericsson and Charles Leclerc. Fastest so far in the weekend was Hamilton who turned a 1:17.281 in FP3 on the super soft Pirellis. Hartley had a big shunt in FP3. He was okay but his Toro Rosso was a wreck so he did not take part in qualifying. First out in the 18-minute Q1 was Stroll. The ambient temperature at the start of qualifying was 64 degrees Fahrenheit (18 degrees Centigrade) and the track temperature was 81 degrees Fahrenheit (27 degrees Centigrade). There was a 40 percent chance of rain. Vettel and Raikkonen put their cars at the top of the timing screens, but then Hamilton came along and split the two Ferraris. As did Bottas. But then Raikkonen retook second place. With five minutes remaining, Vandoorne was 15th and on the bubble. Ericsson was 16th and Stroll was 17th. With three minutes to go the top four were now Vettel, with a time of 1:17.031, Verstappen, Raikkonen and Ricciardo. Hulkenberg did not set a fast lap until the final minute, and that moved him up from 19th to 14th. Then Ocon pushed him down to 15th. Then along came Vandoorne who pushed the Hulk down to 16th. Stroll spun off at the last moment. The four drivers who were eliminated at the end of Q1 were: Hulkenberg, Ericsson, Sirotkin and Stroll. 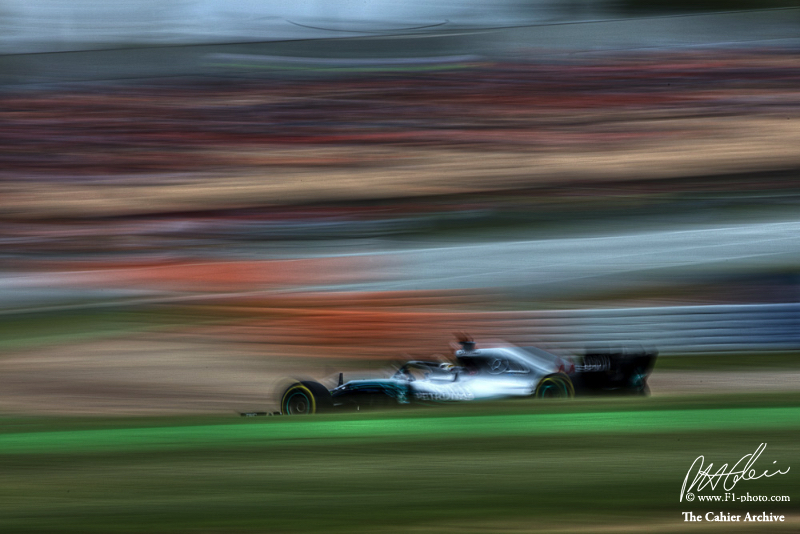 The fastest 15 drivers who moved on to Q2 were: Vettel, Verstappen, Raikkonen, Ricciardo, Hamilton, Bottas, Magnussen, Alonso, Grosjean, Sainz, Gasly, Leclerc, Perez, Ocon and Vandoorne. The Haas duo got the 15-minute Q2 underway. Some of the drivers including the Ferrari and Mercedes lads would attempt to set their Q2 time on the soft compound, so that they could start the race on that more durable tire. Vettel slammed in a 1:16.802. He was the only driver to get below 1:17. Raikkonen, Bottas, Hamilton, Verstappen, Ricciardo, Magnussen and Grosjean were next in the order in the early going. Halfway through the session Sainz was 10th and on the cut line with Alonso ninth and Vandoorne 11th. In the final minutes the Mercedes drivers tried out the super softs, but only as a precaution. There best times were on the softs and that would be their race tire. The five drivers who were eliminated at the end of Q2 were: Vandoorne, Gasly, Ocon, Leclerc and Perez. The fastest 10 drivers who moved on to Q3 were: Vettel, Raikkonen, Bottas, Hamilton, Verstappen, Magnussen, Ricciardo, Grosjean, Sainz and Alonso. The lead drivers switched back to the super soft tires for Q3 which lasted 12 minutes. Vettel had been best in Q1 and Q2, but would he still be ahead when it mattered at the end of Q3? He had never won the pole for the Spanish Grand Prix. There was time for two runs. Hamilton did a 1:16.491. Nobody could beat that, and at the end of the first round the order was: Hamilton, Verstappen, Ricciardo, Bottas, Vettel, Alonso, Raikkonen, who made a mistake on his lap, Grosjean, Sainz and Magnussen. Ricciardo was the first to head out for round two. He was now on the soft tires. He remained third. Raikkonen also tried the softs and got up to second until Bottas pushed him back. Hamilton used the supers to get down to a 1:16.173. That is the new qualifying lap record for the circuit. The top 10 qualifiers were: Hamilton, Bottas, Vettel, Raikkonen, Verstappen, Ricciardo, Magnussen, Alonso, Sainz and Grosjean.